The correct term for Lantern clocks is 'Chamber' clocks. There is a theory that the word Lantern was derived from the word Latten; an old name for brass. This is probably untrue especially as the clocks themselves resemble lanterns of the day. 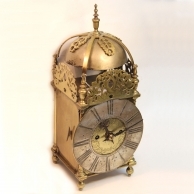 Chamber clocks were the very first domestic timepieces and are still very affordable considering their age, limited numbers and Horological importance. 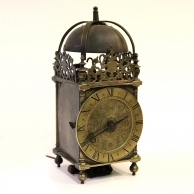 There is a misconception that most old Lantern clocks are fake, this is untrue because the cost of faking one of these items would probably cost more than buying the real thing! What is true though is that most old Lantern clocks are not totally original. 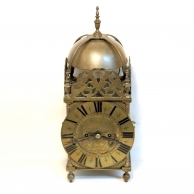 Because of their age and vulnerability, these clocks have quite often fallen off their wall fixings during their lifetime and finials, frets, bells, bell straps and doors have become broken or damaged. Quite often, early owners paid for the escapements to be changed to the more accurate 'Anchor recoil' type with a long pendulum. Also, wheel trains have sometimes been changed so that they would run for 30 hours on a single winding instead of just 15 hours. 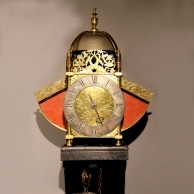 Motion work was sometimes added to allow a minute hand to be fitted instead of just an hour hand; complete spring driven movements were often fitted so that the clocks could be used on a table and only required winding once a week - this practise was carried out at considerable expense and was deemed along with the other alterations as 'improving' the clock. It is generally acceptable to many owners for their Chamber clock to have these alterations even though they could be corrected, the changes are part of the clock's history and intrigue. 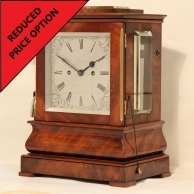 To find a clock that has had little or no alteration is extremely rare and obviously, it will be a lot more valuable. 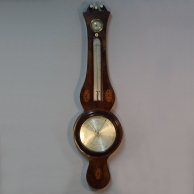 We work closely with the purchasers of our Chamber clocks because there is the aspect of conservation to consider. 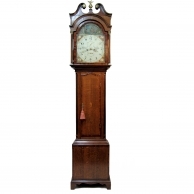 Even though we can correct any fault and make any part, not all purchasers want this so we are happy to have lengthy consultations with them so that we can be sure that once sold, the clocks are exactly as the new owners want them. Some people like the cases polishing as they were originally and the engraved areas such as the front fret, dial and chapter ring silvering whereas others prefer the tarnised and aged look. We do insist however on supplying a clock that is working correctly with a full guarantee. We also explain in full what has been altered on our clocks, what is incorrect and also, what has been 'Bodged'. 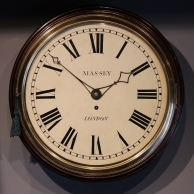 *It is the policy of M C Taylor to explain every aspect of the clocks they sell and it is worth noting that a dealer cannot have the insight into originality that an experienced restorer can. We turn down many lantern clocks that we are offered because of the unrealistic prices asked for clocks that are offered as original and are not and we are appalled at some of the examples sold to people as completely original yet they have have replacement wheels and pinions, poorly aged new frets (look at the edges - they are always brighter than the rest) etc. etc. Mr. Taylor is currently writing a booklet on how to authenticate and buy an English Chamber clock that will be free to download, if you would like notification please email us with the request. 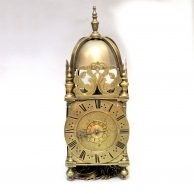 We provide an unbiased vetting service for Chamber clocks for a nominal fee, the items are examined in detail and the results offer peace of mind to the owners. 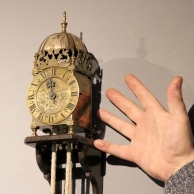 A fine and rare early lantern clock by William Selwood at the mermaid, Lowthborough circa 1640. Not quite what you're looking for? Why not view our complete range click here.